Joseph Bengivengo enlisted at Fort Dix in the U.S. Army Air Corps. on April 6, 1944. His hometown was listed as Essex County, N.J. His service number is 12101977. Corp. Bengivengo was killed in action when the bomber in which he was flying above the Italian Alps crashed on April 15, 1945. 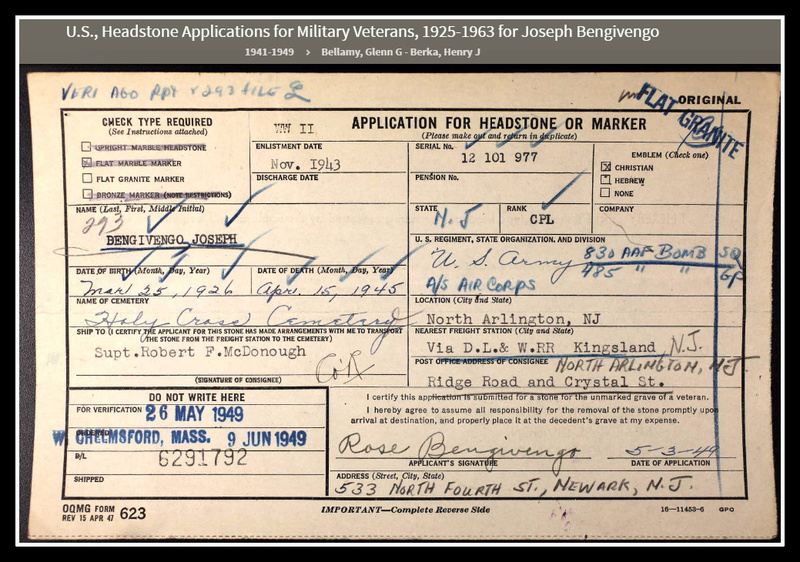 According to the U.S., Headstone Applications for Military Veterans 1925-1963, Joseph Bengivengo was born March 25, 1926 and died April 15, 1945. He enlisted in the U.S. Army in November 1943. His remains were repatriated to U.S. soil in 1949. He is interred at Holy Cross Cemetery, North Arlington, N.J.